New Jersey Search and Rescue provides comprehensive incident management services for all types of missing persons cases throughout the Northeast and beyond. Our skilled volunteer professionals have decades of experience in search operations. New Jersey Search and Rescue personnel are highly trained and hold advanced certifications in Lost Person Behavior, the FEMA National Incident Management System and Managing the Lost Person Incident. 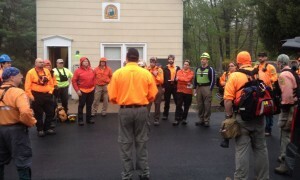 New Jersey Search and Rescue offers ground searchers, search K-9s, medical personnel and mountain rescue services. We specialize in running search operations, locating and caring for the subject and evacuating injured persons. We can work in wilderness, urban, suburban, rural or high-angle environments, as well as at night and in inclement weather. We are on call 24/7/365. Our officers collaborate with local law enforcement, the Search and Rescue Council of New Jersey, FEMA, mutual aid and Homeland Security to run seamless operations, keep search personnel and first responders safe and ensure the best possible outcome for missing persons and their families. New Jersey Search and Rescue is deployed only by law enforcement and does not charge for its services. NJSAR is a 501c3 organization staffed entirely by volunteer professionals. To dispatch New Jersey Search and Rescue contact Bergen County Police at 201-646-2705.